At Hip NI, we perform hundreds of procedures every year with consistently high patient satisfaction. With a proven record of effective treatment and recovery management, you can be sure you are in the best of care at Hip NI. What hip condition may I have? What proceedures are available at Hip NI? You can be sure you are in the best of care with Ortho NI’s leading hip specialists. The extensive experience of our award-winning consultants, Mr Dennis Molloy, Mr Pooler Archbold and Mr Roger Wilson covers a comprehensive range of orthopaedic procedures. Also known as: Arthritis, Arthrosis, Wear & Tear, Hip arthritis is a general term covering numerous conditions where the joint surface (articular cartilage) of the hip wears out. When this occurs, the bone ends rub together and this is painful. In general it affects people as they age (Osteoarthritis-wear and tear arthritis). This can be associated with shortening of the effected limb. Congenital abnormalities – hip dysplasia or shallow hips, previous injuries to the hips as a child can predispose you to the development of osteoarthritis. Pain – increased on activity or at the end of the day, usually felt in the groin or anterior thigh. Stiffness, especially during the first few steps. 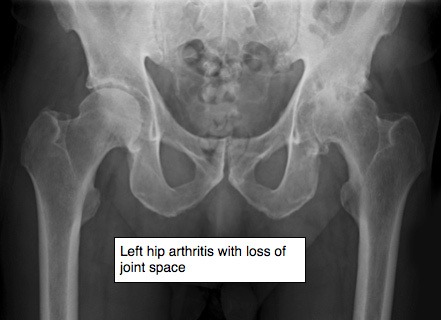 Osteoarthritis of the hip is diagnosed by a clinical examination and the history of your symptoms. X-rays are useful to evaluate the extent of any damage and help your doctor decide the most suitable treatment. The X rays will show a narrowing of the space between the bones in your hip (see below). This indicates the extent of wear to your articular cartilage. Joint replacement is usually only indicated if bone on bone is present on the X ray. 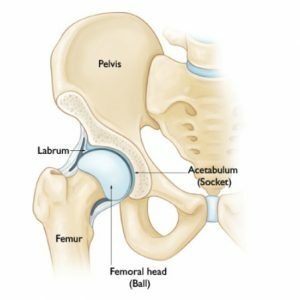 Hip Replacement : Ultimately in cases of severe non-resolvable pain or previous failed treatment options, hip replacement (arthroplasty) is indicated. There are a number of hip replacements available. The choice of replacement depends on a number of criteria these include: the surgeon’s preference, age, activity level, form of arthritis, and the amount of bone affected. Hip replacements are largely successful operations with good long-term outcomes. During arthroscopy, your doctor can repair or clean out any damage to the labrum and articular cartilage. 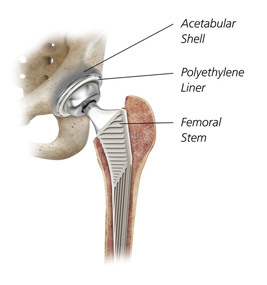 He can correct the FAI by trimming the bony rim of the acetabulum and also shaving down the bump on the femoral head. Some severe cases may require an open operation with a larger incision to accomplish this. What is the trochanteric bursa? In many areas of the body, muscles and tendons must slide over and against one another during movement. At each of these places, a small sac of lubricating fluid helps the muscles and tendons move properly. One of these places is the hip. Usually these sacs of fluid, called bursa function to reduce friction. The hip bone is one such area in the body. What is trochanteric (hip) bursitis? Trochanteric bursitis is a common problem that causes pain in the area of the hip over the bump that forms the greater trochanter. Eventually the pain may radiate down the outside of the thigh. When the bursa sac becomes inflamed, pain results each time the tendon has to move over the bone. The pain may eventually be present at rest and may even cause a problem sleeping. What causes trochanteric (hip) bursitis? Most cases of trochanteric (hip) bursitis appear gradually with no obvious underlying injury or cause. 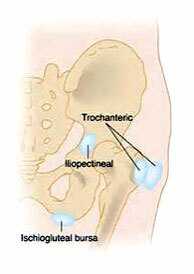 Trochanteric (hip) bursitis may occur after hip surgery. A fall on the hip may also injure the bursa. How is trochanteric (hip) bursitis diagnosed? The diagnosis begins with a history and physical examination. In fact, this is usually all that is necessary to make the diagnosis. The occasional “snapping” that can be heard when walking or moving your leg results from the movement of a muscle or tendon (the tough, fibrous tissue that connects muscle to bone) over a bony structure. 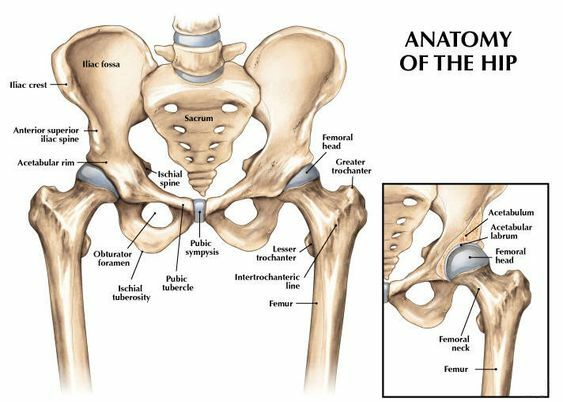 In the hip, the most common site is at the outer side where a band of connective tissue (the iliotibial band) passes over the broad, flat portion of the thighbone known as the greater trochanter. The snapping can also occur from the back-and-forth motion that takes place when the tendon, running from the inside of the thighbone (femur) up through the pelvis, shifts across the head of the femur. A tear in the cartilage or some bone debris in the hip joint can also cause a snapping or clicking sensation. The vast majority of cases can be treated effectively by physiotherapy, involving stretching of the effected soft tissue, strengthening and alignment treatment. Sometimes, treatment with a corticosteroid injection to the area can relieve inflammation. Avascular necrosis (AVN) (also known as osteonecrosis) is a condition in which the bone loses blood circulation to an area of bone. In extreme cases, it can result in the collapse of a segment of bone. When the surface of a joint is involved, it may lead to rapidly progressive osteoarthritis. Avascular necrosis can occur as a result of an injury that interrupts the blood supply, such as in AVN of the hip after a fracture of the neck of femur (thighbone). Other causes include the use of systemic steroids as well as certain inflammatory diseases, such as lupus. The exact mechanism for loss of circulation in these circumstances is not well understood. The most common body parts affected by AVN are the hip and knee. In cases of AVN of the hip, it is very important to diagnose and treat early in order to prevent disability. Treatment varies considerably, depending on the location and severity, but the goal of initial treatment is to prevent collapse of the joint surface. 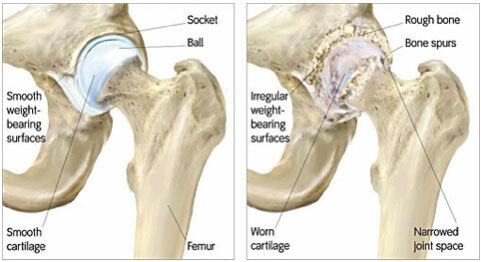 In the advanced stages that result in painful arthritis, a hip replacement may become necessary. Listed are the most common procedures performed on the hip. disorders that cause unusual bone growth (bone dysplasia). A hip replacement is major surgery, so is normally only recommended if other treatments, such as physiotherapy or steroid injections, haven’t helped reduce pain or improve mobility. A hip replacement can be carried out under a general anaesthetic (where you’re asleep during the procedure) or a spinal anaesthetic (where the lower body is numbed). We recommend a spinal anaesthetic as this is a safe procedure that give good post-operative pain relief. The surgery usually takes around 50-70 minutes to complete. The rehabilitation process after surgery can be a demanding time and requires commitment. You will mobilise with help the same day or the day after your operation. You will be given adequate analgesia to make this as comfortable as possible. You will be given a daily injection for 4 weeks after your hip replacement, in keeping with national guidelines, to reduce the risk of developing a complication from Deep Venous Thrombosis formation. For the first four to six weeks after the operation you may need a walking aid, such as crutches, to help support you. You may also be enrolled on an exercise programme that’s designed to help you regain and then improve the use of your new hip joint. Most people are able to resume normal activities within two to three months but it can take up to a year before you experience the full benefits of your new hip. Another operation (revision surgery) may be necessary, although this can’t be performed in all patients. In around 1-3% of cases the hip joint can come out of its socket. This is most likely to occur in the first few months after surgery when the hip is still healing. You can consult your doctor for further advice if you have any concerns about your hip replacement or don’t know which type you have. This isn’t usually painful and can be prevented using medication or radiation therapy (a quick and painless procedure during which controlled doses of radiation are directed at your hip joint). There’s a small risk of developing a blood clot in the first few weeks after surgery – either deep vein thrombosis (DVT) in the leg or pulmonary embolism in the lung. If you suspect either of these types of blood clots you should seek immediate medical advice from your GP or the doctor in charge of your care. If this isn’t possible then call your local out-of-hours service. To reduce your risk of blood clots you may be given blood thinning medication such as clexane, or asked to wear compression stockings. There’s always a small risk that some bacteria could work its way into the tissue around the artificial hip joint, triggering an infection. The National Joint Registry (NJR) collects details of knee replacements carried out in England and Wales. Although it’s voluntary, it’s worth registering. This enables the NJR to monitor knee replacements, so you can be identified if any problems emerge in the future. It’s confidential and you have a right under the Freedom of Information Act to see what details are kept about you. Arthroscopy is a surgical procedure that gives doctors a clear view of the inside of a joint. This helps them diagnose and treat hip problems. During hip arthroscopy, your surgeon inserts a small camera, called an arthroscope, into your hip joint. The camera displays pictures on a television screen, and your surgeon uses these images to guide miniature surgical instruments. This can be used to treat a number of hip conditions. The acetabulum is ringed by strong fibrocartilage called the labrum. The labrum forms a gasket around the socket. This is thought to help form a fluid seal. The joint is surrounded by bands of tissue called ligaments. They form a capsule that holds the joint together. The under surface of the capsule is lined by a thin membrane called the synovium. It produces synovial fluid that lubricates the hip joint. Your doctor may recommend hip arthroscopy if you have a painful condition that does not respond to nonsurgical treatment. Nonsurgical treatment includes rest, physical therapy, and medications or injections that can reduce inflammation. Inflammation is one of your body’s normal reactions to injury or disease. In an injured or diseased hip joint, inflammation causes swelling, pain, and stiffness. Femoroacetabular impingement (FAI) is a disorder where bone spurs (bone overgrowth) around the socket or the femoral head cause damage. Dysplasia is a condition where the socket is abnormally shallow and makes the labrum more susceptible to tearing. If you are having arthroscopy, you will need a physical examination from a physician to assess your health. He or she will identify any problems that may interfere with the surgery. If you have certain health risks, a more extensive evaluation may be necessary before your surgery. Be sure to inform your orthopaedic surgeon of any medications or supplements that you take. He or she may tell you which medications to stop and which to take prior to surgery. The hospital or surgery centre will contact you ahead of time to provide specific details of your procedure. Make sure to follow the instructions on when to arrive and especially on when to stop eating or drinking prior to your procedure. Before the operation, you will also be evaluated by a member of the anaesthesia team. Hip arthroscopy is most commonly performed under general anaesthesia, where you go to sleep for the operation. You will be asked to complete pre-operative questionnaires relating to your hip function and pain. You will be invited to participate in The Non-arthroplasty Hip Registry, a nation-wide registry evaluating the outcome of hip surgery. The length of the procedure will depend on what your surgeon finds and the amount of work to be done. If adequate clearance of bone cannot be achieved through the keyhole technique a small incision (5-8cm) may be used to open the joint. 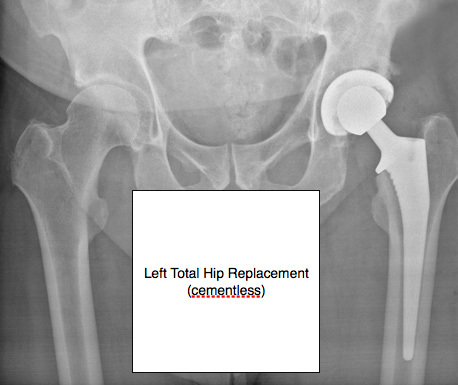 Complications from hip arthroscopy are uncommon. Any surgery in the hip joint carries a small risk of injury to the surrounding nerves or vessels, or the joint itself. The traction needed for the procedure can stretch nerves and cause numbness in the perineal region (groin), but this is usually temporary. After surgery, you will stay in the recovery room for 1 to 2 hours before being discharged to the ward. You usually stay in hospital overnight although this is not mandatory. You can also expect to be on crutches, for some period of time depending on the procedure performed (usually 4 weeks). Your surgeon will develop a rehabilitation plan based on the surgical procedures you required. In some cases, crutches are necessary, but only until any limping has stopped. If you required a more extensive procedure, however, you may need crutches for 1 to 2 months. In most cases, physical therapy is necessary to achieve the best recovery. Specific exercises to restore your strength and mobility are important. Your therapist can also guide you with additional do’s and don’ts during your rehabilitation. 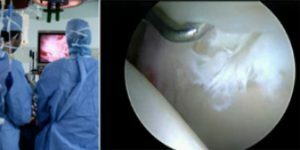 Many people (70 – 80%) return to full, unrestricted activities after arthroscopy. Your recovery will depend on the type of damage that was present in your hip. How is this injection performed? If your doctor uses ultrasound guidance, the nurse will position you on your side. Occasionally your doctor may perform the procedure without the use of ultrasound. Your doctor will clean the area to be injected with an antibacterial solution. They will guide the needle to the greater trochanter. 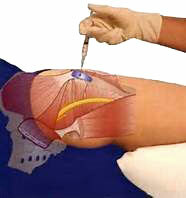 When they are satisfied with the needle placement, he will inject the medication into the area and remove the needle. The nurse will clean the antibacterial solution off your skin and apply a dressing if needed. Just a brief note to record my sincere appreciation for all your professional skills and personal attention. I look forward to getting out and about again very soon. Thanks for everything. Please accept my very grateful thanks for the professional and caring way you treated me during my recent hip replacement surgery. It was very reassuring to know that I was in a very 'safe pair of hands' and that I will soon be back to my normal, active self. Thank you so much for all your help. Your professional, approachable manner was second to none. With best wishes.